Leather Bibles are a must for the traditionalist. The feel, scent and weight of Leather bound Bible excites the senses and tells the reader that they are truly holding the Word of God. Perfect for giving, many of our Leather covered Bibles have Gilded page edges, color maps and ribbon markers. Some are even Gift boxed with standalone gift cards so they make perfect gifts! Just click on the details button for any item to find out more. For those on a budget, we also offer several imitation leather or faux leather Bibles. These wonderful Leather Bibles come in a variety of languages including: Spanish, Chinese and English of course. Most of our English Leather Bibles are available in single copies or in bulk by the case lot. 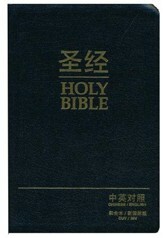 Most of our other international language Leather Bibles are available in either single copies or by the case. The available texts are: NIV, NVI, NASB, KJV,TNIV and a variety of Outreach specific texts. A compact edition, this NVI Award Bible is slender and yet of the utmost quality. It makes a good award or gift, but is also priced nicely for outreach or evangelism. Beautifully designed for years of use, these NVI translations feature leather covers, ribbon markers, and durable pages. Good as awards, they are also available in bulk. The ideal gift or award, this NVI Spanish translation is crafted with leather covers, high quality paper, and a ribbon maker. Affordably priced by the case too.